This chapter presents current research insights into forms of theoretical, empirical, and artistic contributions to the scholarship from self-as-subject research and others who blended these approaches with other methods. 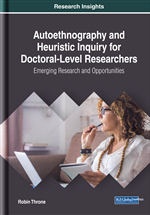 Illustrations of resonant and relevant inferences and contributions from current doctoral research that used either and/or both autoethnography and heuristic inquiry or with other methods are highlighted. These examples showcase how and why self-as-subject research method findings from the current research can offer fresh insights into the phenomenon of inquiry for self, others, society, and the discipline for a culminating doctoral research study. For doctoral researchers who conduct doctoral research using a self-as-subject research approach, the final discussion, conclusion, or contributions sections of the final doctoral research study report can also serve to be an illuminating writing experience whereby the doctoral research can once more dive into the intrinsic and tacit knowledge to describe how the study findings contribute to new knowledge of the self-focused phenomenon of inquiry—not only for the self, but also as contribution of new knowledge for others, society, and the discipline are allowed as a basis for doctoral research and a root for further elucidation in a doctoral-level research project or dissertation research study. Or as Honan and Bright (2016) denoted, as new spaces for doctoral study writing are offered, new forms of knowledge may emerge as well as for doctoral researchers to evolve to professional and academic writing opportunities (Rubinstein-Avila & Maranzana, 2015). For some doctoral scholars, the very nature of self-introspection as research can be fraught with self-doubt as a doctoral scholar may fear these methods are lesser in rigor than methods that involve the study of others (Learmonth & Humphreys, 2011); although, as Le Roux (2017), evaluative criteria for self-as-subject research or quality assessment criteria may enhance its acceptance and contribution. For other doctoral researchers, considerations for use of autoethnography or heuristic research are necessary and situated as secondary critical representations when an empirical study of the experiences of other human subjects or archival data gathered from others is required or expected; yet, the journey of the self is often recorded concurrently and may be examined post-hoc or contemporaneously in other academic forms (journal articles, conference proceedings, or arts-based research products) as a companion to the representations of others. For Bochner (2018), the deep reach of self-as-subject qualitative inquiry may broaden and deepen the human community and thereby offer contributions to social justice. Moustakas (2001) encouraged heuristic researchers to set forth potential contributions of the inquiry in the research proposal and offered the following prompt to facilitate this forecast: “How would new knowledge contribute to your profession, and to you as a person and as a learner? State your question and elucidate the terms” (p. 285). Once a doctoral researcher has elucidated the terms of the potential contribution in the research proposal, it provides a loop back for the researcher to reflect upon when the findings have been determined and the actual contribution of findings can be iterated in the final report of the doctoral study. Also, as Hiles (2002) described heuristic indwelling as a process whereby the researcher undergoes inner reflection and discovery to gain new insight, expanded awareness, and fresh or innovative practical implications that only the self-as-subject researcher can offer as contribution from the discoveries uncovered. In addition, Douglass and Moustakas (1985) stressed that by making contact with the tacit dimension, contributions for new knowledge remain possible from self-as-subject research. Thus, the contributions noted from HI are unique and can only be gained from the distinct perspective and tacit knowledge of the researcher-participant and the self-as-subject researcher may be further informed by the basic procedures Hiles (2002) offers to the reader for how to embark and engage heuristic indwelling within heuristic inquiry (HI). Or perhaps, doctoral researchers, whether through experience or training, already possess the self-awareness of introspection as a path to new knowledge, such as Sela-Smith (2002) described it: “Many years of working with my personal myths on the tacit level has caused me to conclude that my outer world experience is formed of my inner world” (p. 85).